I made char siew chee cheong fun since I have some char siew left in the fridge. Very nice. Using estimation method, I made the salty/sweet sauce to go with the CCF. The sauce is something like the one served at dim sum restaurant. Finally got my friend's approval to post the CCF recipe in my blog. I have however change the method slightly to omit using the muslin cloth. I also did not use my friend's recipe for the tim cheong (sweet sauce) but instead create one for my own liking. For those who would like to try this out, remember to let me know how it turn out for you ok.
1. Sift dry ingredients together. 2. Slowly add the water, mixing as you add. 3. Lastly add the oil and salt and mix thoroughly. Set batter aside for at least an hour. 4. Prepare your steamer. Grease a swiss roll pan or any aluminium tray with oil and pour the batter directly on the pan and steam for 5 mins. 5. After steaming, using a plastic scrapper roll the ccf up. If you are using ingredients like char siew or prawns, you can sprinkle it over the steamed ccf and then proceed to roll it up. 6. Place in a plate brushed with a little oil. Continue with the rest of the batter. 1. Place ginger with oil and sugar in a pot. Cook over small fire until sugar turns brown. 2. When sugar is brown, add in the rest of the ingredients. Cook over medium fire for about 5 mins. Taste the sauce and adjust taste accordingly. If you find the sauce too sweet, you can add in a bit of salt. Mix all ingredients together and cook over medium heat until it thicken slightly. Let me check with my friend to see if I can post it here. I've linked you in my blog! Hope you don't mind! Can't wait to see the CCF recipe! Yay! Thanks once again! Appreciate it! Hi Rachel, I have already asked but still waiting for her to reply to me. Thanks for linking me in your blog. You have a very nice blog and I visit your blog regularly too. Thanks lavender cupcaker. Are you going to try out this recipe? Hugbear, thank you for the recipe. 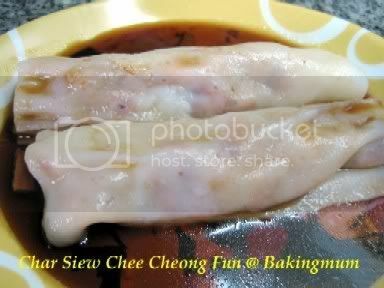 I used to make my cheong fun in the microwave but will try the steaming method. Do you have to use a big wok to steam if one is using a swiss roll cake tin? Hi dr ve thru, use any wok or steamer that you have and find some metal plate or tray that can fit it. For me, I used my tray and steam it over my wok, as my tray will not be able to fit into my steamer. Happy trying and let me know if you are happy with the result ok.
i love this at dim sum. i think i have most of the ingredients will try! if i convert it to tbsp and stuff will the recipe still work? Hi buddingcook, it should be ok. Remember to let me know if it works ok.
hey was wondering is there any subdtitute for the wheat startch flour? so i can make it this weekend with my stuff in the pantry! any other flour? i ahve all kinds except that...will it make a difference if i omit it? Hi Shinigami, don't substitute it with anything. Just omit it. It won't affect the texture that much. The wheat starch is just to make the CCF softer. I tried using your recipe but it did't turn out at all. It was hard and cracked as I tried to lift out with the plastic scrapper. In addition to that, it taste "flour-like". Any suggestions on what went wrong and how I can improve? Hi sinmal, remember to stir the mixture well. Make sure the flour is well incorporated with the water. When steaming the CCF, give it a good stir before scooping it onto the steaming tray. By doing this, it should not give you a floury taste. Try not to make the layer too thick too. Roll the CCF while it is still hot. I tried your CCF without fillings. Just cut it up and drizzle with CCF sauce and also sesame paste sauce, sprinkle with sesame seeds. Wow, it was delicious and reminded us of those found in the market where you normally get them for breakfast. Btw, what is the reason for resting the batter for at least 1 hr? Sending you a pic, ok? I tried making the ccf today. Its FANTASTIC!! very yummy!! even the sauce tastes good!! But the ccf was a little too thick...when I tried to pour lesser into the tray, it became mushy. What was the size of the tray you used? Also, when should I start rolling? Thanks again for the yummy recipe! Hi Angela, glad that you are happy with the result of your CCF and the sauce. Try not to pour too much batter into the tray. In fact it doesn't matter why type or size tray you use. Just tray pour enough batter to cover the pan thinly. Just swirl the batter around the tray to have it well coated. As soon as the CCF is done steaming, you can roll it up immediately. I tried this ccf recipe again today. When I pour the batter thinly, it seems that the oil causes the batter to spread to one corner. Does that happen to you too? I use a 10" by 10" tray. Could it be too large? Is your friend's recipe for the sweet sauce the red or brown type you see in hawker centers? Do you think you can email me the recipe? Cos here in the Bay Area, I can get ready-made CCF, but I cannot get the sweet sauce. I tried your CCF recipe and was absolutely disappointed by how it turned out. The surface of my CCF was so wet that it stuck together after I rolled it. Can I ask how many ozs is 2 cups of water. I used an online convertor and so used 16 fl ozs. :( Had been looking forward to savouring the CCF having admired your pics for so long. Hi Simscook I will try to get the sweet sauce recipe for you. Hi Anonymous, your conversion is correct. After the CCF is cooked, you brush some oil onto the CCF before rolling it up. Thanks for your reply- I think my problem was not waiting till it cooled before rolling. Having watched a video of waikatere redneck making kway teow on http://neckredrecipes.blogspot.com/, I will attempt to make the CCF again. :) wish me luck!! hi! I came across your recipe while looking for a sauce recipe for CCF. I tried to make it but everytime I pour in the second part of the sauce (your version) the sugar and oil in the pot already jumps all over and there'll be alot of crackling and jumping of oil and the sugar ends up hardened/burnt!!! Would appreciate some help! thankS!! If that is the case, I suggest you fry the ginger with the oil a little bit. Then add in the rest of the sauce ingredients at the same time and let it boil. Very hard to roll ccf up. It was not totally sticky. During the rolling, bits and bits stuck on plate and just couldn't get it done as in your pic. First I used metal plate directly, later i placed one more layer of foil on top of metal plate and tried brushed more oil on it. Sad to say, just couldn't get it done as smooth as in your pic. Try to roll it up with the help of a metal scrapper or plastic scrapper. Like those you see they use by hawkers selling CCF. You scrape as you roll so it helps to keep the CCF in one piece. I just tried out the receipt below are some of my experiance to share. Must use big fire to cook the ccf then the skin will not be hard and easy to roll. Once I used small fire n the skin end u hard n unable to roll at all. I used prawn; ideal is 3 pcs. Once I put 5 pcs n the skin got torn up while rolling. 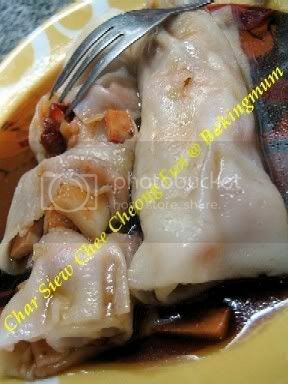 I love cheung fun! I have to try this soon! :) thanks for all the great recipes!